We were recently in Atlanta as a sponsor of the USPTA Southern Conference Welcome Party. 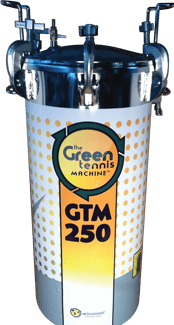 We met with Dave Dvorak, Dunwoody Country Club Tennis Director, and discussed the impact his Green Tennis Machine has on all their club programming. The word “amazing” was used a lot! If you haven’t heard of Dunwoody Country Club tennis… your not in the Country Club business 🙂 That is okay, because we have tons of other testimonials for you to review. If you reside in the South, you probably know of Dave Dvorak. Dave was recently inducted into the USPTA Southern Hall of Fame! Dave was honored in 1991, 1994, & 2001 as the USPTA Georgia Pro of the year. In 2003 he was named the USPTA Southern Professional of the year. 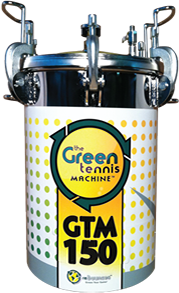 We’ve been really happy with [our Green Tennis Machine]. We recharge balls all the time and it’s been a big benefit to us to continue providing our customers with a lively ball in their teaching carts in particular. My name is Dave Dvorak and I work at Dunwoody Country Club here in Dunwoody, Georgia. Yes, I think it’s certainly a benefit to your teaching program and your members will be thrilled or your students (I should say) will be thrilled because they are using new balls all the time. We are a 14 court facility, we have 10 hard courts, 4 clay courts, very active tennis program. And we are very busy we have 4 pros, 5 pros on staff at our country club and just a lot of tennis crazy folks and we love that. In 2003, Dunwoody Country Club tennis program was honored as the United States Tennis Association’s “Facility of the Year” in the category of private Clubs. In 2011 Dunwoody Country Club Tennis was named the “Tennis Program of the Year” by the Georgia Professional Tennis Association!! !